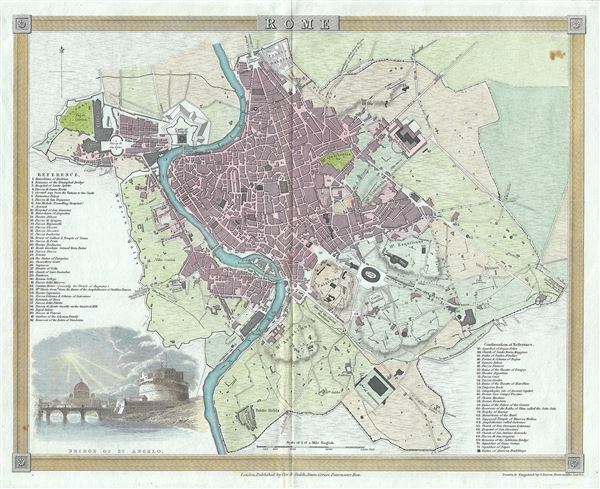 This is a beautiful 1840 map of the city of Rome, Italy by John Dower. It covers the walled center of Rome in incredible detail, reveling individual streets, parks, rivers, ancient ruins, and historic buildings. A list of important landmarks is referenced along the left and right margins, while a beautiful illustration of the Bridge of St. Angelo features in the lower left quadrant of the map. This map heavily references, with various updates and revisions, the seminal 1734 map of Rome by Giovanni Battista Nolli. Nolli's map was the first modern map of Rome and basis of almost all subsequent maps of Rome until approximately 1870, when Rome became the capitol of Italy and more modern plans were issued. This map was drawn and engraved by John Dower and published by Orr and Smith in 1840. Very good. Original platemark visible. Slight wear along original centerfold. Minor foxing in top right quadrant.